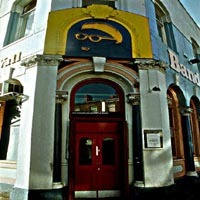 One of Manchesters older venues and traditional home to the local Musicians Union. Offers a wider variety of music, with Soul, Jazz, Country and sometimes folk gigs from established artists. A great atmospheric venue of obvious architectural value, pushing against it’s northern quarter neighbours, TBOW has been there the longest, with the most varied menu of music on offer. For indie and Alt.flavoured openings, bands can contact Mr Slater for the long running "showcase well north of london"